Former Chief Minister Amarinder Singh today alleged that the Badal government had posted its informers on his security duty. Former Chief Minister Amarinder Singh, who had remained elusive to congressmen for weeks together after the installation of the SAD-BJP government in Punjab, at a rally held here today said atrocities being committed on innocent Congress workers by the government would be opposed tooth and nail. A high-level committee, set up by the Punjab government to carry out physical verification to determine whether mega projects are located near polluting industries and violate the policy guidelines on checking pollution, has completed its survey. Orissa’s finance minister has presented a surplus Budget for the current fiscal. The Bihar finance minister has given permission to recruit 3.5 lakh youths this year to fill the vacant and newly-created posts in that state. Haryana finance minister has not rejected any worthwhile proposal for the recruitment of employees. Are 39 pc families really poor? It has often been asserted that Punjab didn’t participate in the First War of Independence and Punjabis worked against the cause. But Chandigarh-based eminent scholar of Punjabi studies Harnam Singh Shaan has found irrefutable evidence showing that Punjab not only participated in the War, but also its people smilingly laid down their lives. Only they were never saluted for their role. The population of the sarus crane, the tallest flying bird in the world, is on the rise in Punjab. After its regular sighting in the Nangal area, it can now be spotted in Gurdaspur district also. The sarus crane attains a height of up to 6 feet, with a wingspan of 8 feet. It is the tallest of all 15 species of cranes in the world. 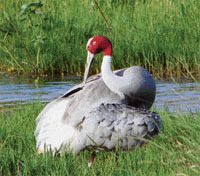 Its habitat is shallow wetlands, marshes, ponds and fields. Binder Kaur, a pregnant woman of Rai ke Khurd village, who was allegedly forced into having an abortion by her husband Jaspal Singh, was rescued by the officials of the local PNDT cell and a doctor working at the Civil Hospital here today. Punjabi University vice-chancellor Swaran Singh Boparai has sought the registration of case against the members of the joint action committee for allegedly bringing disgrace to turban. In a press release issued here today, the university authorities have maintained they have written to the police for the registration of case under Section 295-A of the IPC (hurting the religious sentiments). In a far-sighted demand, Hoshiarpur MP Avinash Rai Khanna has demanded that the union government should bring in a legislation to make dope test mandatory for students seeking admission in professional colleges and an HIV test mandatory for marrying couples. Local resident Manmohan Chadha (55), who got his kidney transplant done at Rasheed Hospital, Lahore, died here today only after two months of the surgery. Chadha, a bank employee, had opted for pre-mature retirement on health grounds. An Air Force team from Delhi today visited the Adampur airbase to investigate into the MiG 29 aircraft crash at Daroli Khurd village near here last evening. Two persons were injured today when stray dogs attacked them. Elderly persons aged 50-66 appeared for the Class III annual examination organised by the District Literacy Society at the Hanumangarh junction, about 60 km from here, yesterday. A canter driver, employed by a private company dealing in nature cure products, was killed today in an accidental firing, sources said. A number of women today gheraoed the executive officer (EO) of the local municipal council, executive engineer and SDO of the Punjab State Water Supply and Sewerage Board for more than two hours in the office of the EO here in protest against the non-supply of drinking water for the past some days to their houses in the Padhian Wala Mohalla (Dhuri gate) here. A doctor, having a humble background, was today sanctioned a grant of Rs 3.5 lakh from the Punjab Chief Minister’s relief fund to participate in a competition abroad. Chairman of the Punjab State Electricity Board Y.S. Ratra has said in order to mitigate the difficulties of electricity consumers in the state, the PSEB has decided to hold “bijli darbars”. Three important posts of PCS officers at district headquarters and one of executive officer, Municipal Council Sirhind-Fatehgarh Sahib, are lying vacant, causing inconvenience to the people besides hampering work. The National Theatre Arts Society (NTAS) in their 68th monthly garden theatre programme, “Punjabi Hass Raag Rang”, presented “Naqlan”, here today. Daler Mehndi presented himself before the trail court here today as his revision application against the summoning orders was rejected by the Additional District and Sessions Judge. The trail court judge Rajvinder Singh fixed June 6 as the next date of hearing for arguments on framing of charges against Daler Mehndi in a case registered against him by the Patiala police. Daler Mehndi has been accused of duping a few residents of the Patiala on the pretext of sending them abroad with his dance troupe. After a long and patient wait and giving him a “long enough rope”, the Punjab and Haryana High Court today issued bailable warrants against B.I.S. Chahal, media adviser to former Chief Minister Amarinder Singh, in a contempt of court case. The Punjab and Haryana High Court today directed the Punjab government to place before it the notification ordering the bifurcation of Majitha and Jagraon police districts and their re-designation as Amritsar (rural) and Ludhiana (rural), respectively. The Bar Council of the Punjab and Haryana High Court today produced documents relating to the licence issued to transport minister Master Mohan Lal Sharma, before the court of Subdivisional Judicial Magistrate R.K. Garg, Pathankot, today. The chief agriculture officer here has cancelled the licence of Kansal Sales Agency for its alleged involvement in supplying a particular kind of weedicide to a large number of farmers living in the area, which has adversely affected the soil fertility and rendered it unfit for sowing any crops for one year at least. To monitor the activities of the smugglers and analyse their network in Sangrur, a district-level narcotic cell has been set up by the police. The police raid on travel agents’ premises in the city last evening for the verification of documents and activities paid off today with the busting of an alleged immigration racket run by the Nanny Course institute in BRS Nagar and another by a marriage bureau near grain market. NRIs contributing to the Golden Heart scholarships of Punjabi University have expressed concern over the developments on the campus. One of the donors, Baba Daljit Singh Chicagowaley, founder and chief of Guru Nanak Sikh Mission of America, said foreign donors were perplexed due to the developments in the university.